Who will eventually have more titles? They both holder of all-time record at their best GS tournament. Now Federer has one extra title in Wimbledon than Djokovic at the Australian Open, but Djoker is 6 years younger and has better prospects to raise his record number. But of course this is not a guarantee, that his AO record will be ultimately higher than the Fed's record in Wimbledon. Which number of titles will ultimately be higher, according to your forecasts? Or do you expect it to be the same (eg Djoker in future will gain one title on AO and Fed won't win Wimbledon, then the number of titles would be 8-8)? Both the same, with the next most likely being Djokovic at AO. He’ll get a few chances but I do think he might get a challenge or two in Australia as he ages. Hold on. I'll edit my reply here again. I think the next 365 days will probably answer this question. Federer still have a very legitimate shot to win Wimbledon this year, if he does, then I feel winning the next AO will be a must for Djokovic if he wants to surpass Federer in this particular metric. 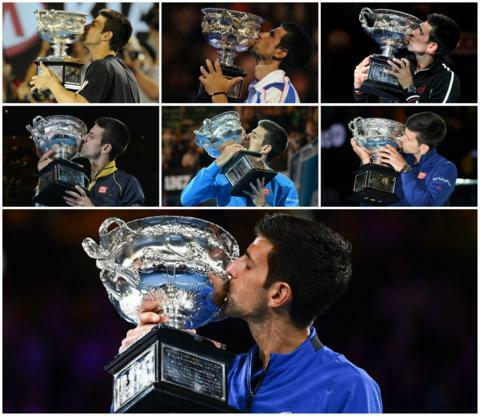 the djokovic trophy kiss, the nadal trophy bite and the federer trophy lift. 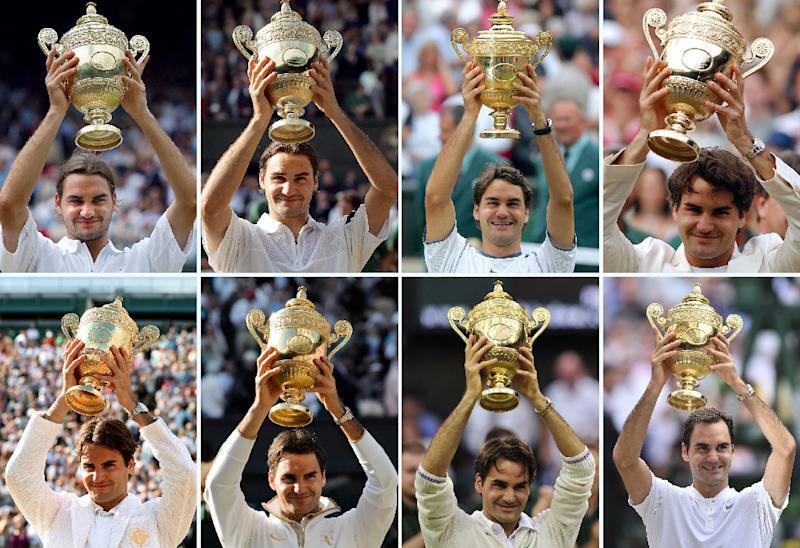 That's how Federer hurt his back....lifting too many trophies over his head without proper form. I don’t see Federer winning another Wimbledon. I see Djoko getting 2 more AO! So I think Djokovic 9 and Federer 8, therefore Djoko just! If the weak era continues like it has been last 5 years - then Djokovic can probably target Rafa at FO. Probably Novak, but things can change quickly. Right now, any record of Federer's that Novak is relatively close to (I don't consider GS here quite yet), you can only assume he will break it because you can never foresee exactly when a guy's form will drop or in some cases completely fall off like Novak in 2017. So I'd exercise caution on any of these predictions. Let's hope they both stay healthy. That's the most important thing. I say 'I'm for youngsters' but we've got nothing so far. As for 'who is going to win what' ... time will tell. Nole is younger, very focused. Roger is still there. It should be fun. You never know . Rafa at RG is a stretch, but Fed's 8 at WB definitely is not beyond the realms of possibility. I want to say Djokovic won’t be able to win two more, but the world number three and the man who’s pipped to be the next great slam champion just lost to a guy with no weapons and a game that purely based upon consistency and running, but is turning 37 in a few weeks and is on his retirement tour. It's funny how Novak looks identical in 3 of those and near identical in 3 others. Only his 08 stands out. If you colour Wimbledon green, you can't colour Australian Open in orange. It's against tennis culture. Should be Australian Open. It's the happy blue slam after all. It's not orange color, but yellow color. This one is an orange color. Djokovic of course. He is 6 years younger and has obviously more time. Fed is approaching 38 and can't sustain a high level for much longer. That said, Fed has been continually surprising us just when we're ready to write his obituary. I wouldn't put it past him to surprise us all yet again! Djok will get 10 AOs, with the last coming in 2027 or 2028.